In order to better understand what a luxating patella is, we should first review some anatomy. The patella (kneecap) is a small bone that sits in a groove near the bottom of the femur (thigh bone) and helps make up the knee joint in pets and people. The muscles of the thigh attach to the top of the patella and a strong ligament connect the bottom of the patella to the tibia (shin bone). As the pet takes a step, the patella slides up and down in this groove to protect the knee joint. If the patella slides out of its normal resting place, this is a called a luxation or dislocation. When the patella slides back into normal position, this is called a reduction. Patellar luxations are most common in small breed dogs such as Yorkshire terriers, Maltese, and Lhasa Apsos, but can occur in any dog breed and cats. Luxation can happen in one hindleg or in both at the same time. 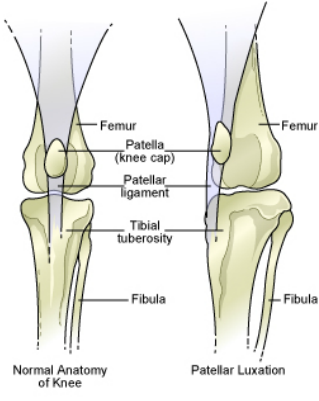 This condition is generally caused by a congenital defect- the groove of the femur that the patella sits in may be too shallow and / or the patellar ligament is not attached in the appropriate place. As luxations continue to occur throughout the pet's lifetime, the groove of the femur gets worn down as the patella pops in and out of place- this causes increased severity and frequency of luxation and predisposes to early arthritis formation and cruciate ligament tears. Symptoms of luxating patella generally appear around six months of age, but these early symptoms might be quite subtle- an intermittent skip in your pet's steps or momentarily holding one hindfoot up in the air. Some pets with luxating patellas have poor skeletal alignment and may stand "bow legged". Your pet may not necessarily exhibit obvious signs of pain other than sporadic limping. The severity of the condition is categorized by grades (listed below). Luxating patellas that are a Grade I do not require surgery to repair, but a long term glucosamine supplement such as Dasuquin should be started to help prevent arthritis formation. Surgical repair should be considered in higher grade cases. During surgery, the patellar ligament is moved to a more appropriate location, the groove in the femur is deepened so that the patella stays in place, and the joint capsule is tightened. Prognosis is excellent with surgery if the procedure is performed before arthritis starts. If arthritis has occurred, surgery will still help your pet retain use of the leg, but long term pain relievers may be needed.